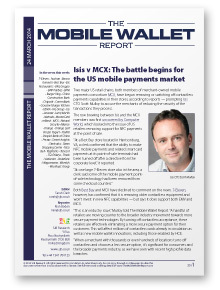 Isis v MCX — The battle begins for the US mobile payments market: 7-Eleven and Best Buy, both members of MCX, are reported to be removing contactless payments terminals from their US stores, prompting Isis CTO Scott Mulloy to accuse the merchants of reducing the security of the transactions they process. Burger King to roll out mobile payments and rewards across the US, prepares to go global: “One of the reasons the platform was selected is its ability to be easily localized in terms of both language and cultural differences,” the chain says. Biometric payments get thumbs up from French shoppers: More than 90% of the participants in a biometrics payments pilot are ready to make use of the technology, according to newly released results from the Natural Security Alliance. Organisations mentioned include 7-Eleven, Auchan, Banca Generali, Best Buy, BJs Restaurants, BNL Gruppo, BNP Paribas, BPM, Burger King, China Construction Bank, Chipotle, CommBank, Gourmet Burger Kitchen, GSMA, IHL Group, Isis, Lavazza, Leroy Merlin, Mahala, MasterCard, mBank, MCX, Natural Security Alliance, Orange, Orange Leaf Frozen Yogurt, PayPal, People’s Bank of China, Prezzo, Smart Insights, Starbucks, Swan Shopping Centre, Taco Bell, TagPoints, Tencent, TGI Fridays, Tmob, Vodacom, Vodafone, Wagamama, Wendy’s and Wu Music Group. 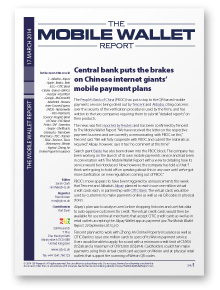 Central bank puts the brakes on Chinese internet giants’ mobile payment plans: The People’s Bank of China (PBOC) has put a hold on the QR-based mobile payments services being rolled out by Tencent and Alibaba, citing concerns over the security of the verification procedures used by the firms. Danish carriers offer mobile ecommerce payments, plan to expand to physical stores: “We have decided that payment or collecting payment or making payment is not any longer a bank service”, Peter Bredgaard, CEO of carrier-owned Paii, tells The Mobile Wallet Report. Tarrytown Pharmacy uses beacons for shelf-edge offers: Shoppers need to wave their phone within six inches of the beacons — which supplier Shelfbucks calls “NFC-BLE” devices because of their short range — to get further information, offers and discounts about the particular product associated with each beacon device. Organisations mentioned include 3, Alibaba, Alipay, Apple, Baidu, Bain & Co, CITIC Bank, Clinkle, Danal, EMVCo, Feedzai, FocalTech, Google, McDonald’s, Mediatek, Nassau Inter-County Express (NICE), Nationwide, Paii, Payments Council, People’s Bank of China, PKO Bank Polski, SAP, Seamless, Seeper, Shelfbucks, Starbucks, Tarrytown Pharmacy, TDC, Telenor, Telia, Tencent, Tesco, Webmoney, Weixin, Yapital and Zhong An Online Property Insurance. 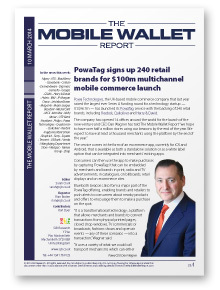 PowaTag signs up 240 retail brands for $100m multichannel mobile commerce launch: “We hope to have over half a million stores using our beacons by the end of the year,” Dan Wagner, CEO of the UK-based mobile commerce company that last year raised the largest ever Series A funding round for a technology startup, has told The Mobile Wallet Report. US Bank to pilot mobile shopping platform: Like Powa, US Bank also plans to make use of digital watermarks that can be embedded in magazines, newspapers and catalogues as well as audio and video broadcasts, director of payments innovation Todder Moning explains. Organisations mentioned include Alipay, ATG, BlackBerry, Caixabank, Cellum, Demandware, Digimarc, Gemalto, Google, GSMA, Harry & David, Hybris, IBM, JP Morgan Chase, LetsMoveDown, Magento, Major League Baseball, MasterCard, MCX, Monitise, Nellymoser, OTP Bank, Paydiant, Philips, Powa Technologies, Qualcomm, Quiksilver, Reebok, Rugby Football Union, Shopkick, Sony, Square, Tencent, US Bank, Venda, Wangfujing Department Store, Westpac, Yankee Group and Znap. 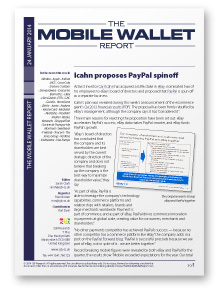 In this edition of The Mobile Wallet Report we present an eight page special report on a new tokenization framework being developed by EMVCo at the request of Visa, MasterCard and American Express. 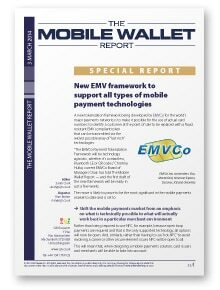 Around a wide ranging interview with the chair of EMVCo’s board of managers, Christina Hulka, we set out why this addition to the existing EMV standards is set to have a profound impact on the future of the mobile wallet market. 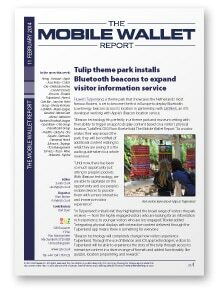 Tulip theme park installs Bluetooth beacons to expand visitor information service: iBeacon technology “will completely change how visitors experience Tulpenland”, technology provider LabWerk’s Floris Boekel tells The Mobile Wallet Report. Starbucks CEO to take charge of next gen payments initiative: “We are just beginning to appreciate the full magnitude and possibility of the Starbucks mobile payment platform opportunity,” CEO Howard Schultz has told investors. Apple is “intrigued” by mobile payments, says CEO: “You can tell by looking at the demographics of our customers and the amount of commerce that goes through iOS devices versus the competition, that it’s a big opportunity on the platform,” says CEO Tim Cook. Organisations mentioned include Airtag, Amazon, Apple, Assa Abloy, Clutch, Dia, DMEautomotive, Dunkin’ Donuts, Emu.me, Fluwel’s Tulpenland, Henry’s Cafe Bar, Jurys Inn Hotel Group, Khosla Ventures, LabWerk, Major League Baseball, MasterCard, Mintel, Mobeam, National Football League, OpenTable, Otto Group, Paysafecard Group, PixelPin, QikServe, Sky, Square, Starbucks, Starwood Hotels & Resorts, Tapingo, TCG Management Services, Tesco, Weve, Wirecard and Yapital. Icahn proposes PayPal spinoff: Activist investor Carl Icahn says PayPal should be split off from eBay as a separate business, but management has three reasons why the two should stay together. MasterCard explains its plans for remittances: “We are going to offer a broader set of services which includes helping consumers get money, or receive money, and obviously to do it in a form that is electronic,” says Michael Fiore, the payments network’s group head of personal payments and mobile products. Swedbank to close QR code payments service: “Actors in the market, consumers, merchants and other banks have not embraced the Bart solution to the extent that was anticipated,” Carl Molinero, the Swedish bank’s head of mobile payments, tells The Mobile Wallet Report. Organisations mentioned include Alibaba, Apple, Axfood, BICS, Coca-Cola, Deckers Outdoor, Demandware, Descartes Biometrics, eBay, eServGlobal, ETRI, GNC, Goodix, HomeSend, iZettle, Jumio, Kadona, MasterCard, Mediatek, NearBytes, Paydiant, PayPal, Radius Networks, ShopperTrak, Societe de Transport de Montreal, Swedbank, T-Mobile, Tencent, The Jones Group, Verifone, Viableware and Visa Europe. 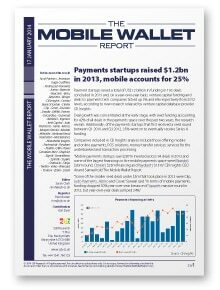 Payments startups raised $1.2bn in 2013, mobile accounts for 25%: 94 mobile payments startups raised a total of $287m last year, CB Insights CEO Anand Sanwal has told The Mobile Wallet Report. Accel Partners and Andreessen Horowitz were the most active investors. Jordan preps national mobile payment platform: “Five mobile payment service providers are expected to link with the Central Bank of Jordan’s new JoMoPay switch,” the CBJ’s Maha Bahou says. Three are MNOs and two are card payment service providers. NRF Big Show: Bluetooth beacons gain ground in stores: American Eagle Outfitters to trial Shopkick’s iBeacon platform in 100 stores, PayPal to release iBeacon payments early this year, iMobile3 partners with POS maker Ingenico for Bluetooth LE payments, Netclearance introduces Whisper Mode for short range Bluetooth LE payments, and more. Organisations mentioned include Accel Partners, American Eagle Outfitters, Andreessen Horowitz, Azimo, Baynote, Beaconic, Boku, Braintree, Bringrr, CB Insights, Central Bank of Jordan, Clinkle, Clip, Cover, Discover, Dwolla, EMN8, Evertec, GoCardless, Gumroad, iMobile3, Ingenico, Intel Capital, Judo Payments, Jumio, Micros, Morgan Stanley, Mozido, MPayMe, National Retail Federation, Netclearance, New Media Insights, Parkmobile, Paydiant, PayPal, QiWi, Royal Canadian Mint, Shopkick, Signifi, SmartMetric, Spindle, Square, Starbucks, Stripe, Twitter, Volvo, Wirecard, YouGov, Zebra and Zuora. 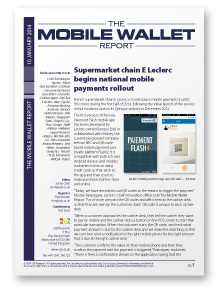 Supermarket chain E.Leclerc begins national mobile payment rollout: All 569 of the French chain’s supermarkets will accept payments via the retailer’s own QR-based mobile payment app by mid-2014, chief innovation officer Nicolas Paepegaey tells The Mobile Wallet Report. InMarket rolls out Bluetooth beacons to US grocery stores: The first 150 stores are now going live and thousands of supermarkets are expected to sign up for the mobile marketing service by the end of this year, CEO Todd DiPaola says. First Fido Alliance products demonstrated at CES: Products conforming to the consortium’s preliminary specifications for an open hardware-based replacement for passwords include a palm-sized iris verification device, a remote control for smart TVs that includes a finger scanner, portable fingerprint devices, voice verification software and a range of biometric dongles. Organisations mentioned include 1OAK Technologies, Agnitio, Alipay, Barclays Bank, Coinbase, Consumer Electronics Association, CrucialTec, Delivery Agent, Didi Taxi, E Leclerc, eBay, EgisTec, European Banking Authority, EyeLock, Federal Reserve, Fido Alliance, Fingerprint Cards, FingerQ, Go-Trust, Google, H&M, Infineon, InMarket, Juniper Research, Mobey, Nok Nok Labs, O2, Parks Associates, Radius Networks, Sina Weibo, Sonavation, Synaptics, Tencent, Texas Instruments, WillCall and Yubico. 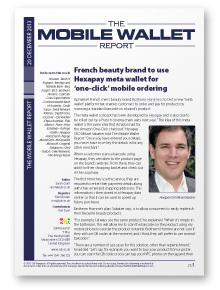 French beauty brand to use Hexapay meta wallet for ‘one-click’ mobile ordering: Biotherm Homme is to test a new “meta wallet” platform that enables customers to order and pay for products by scanning a standard barcode on a brand’s product. Eftpos Australia trials cloud-based mobile payments: The new solution will work with any device, channel or payment transmission method, CEO Bruce Mansfield explains. Shell customers to buy fuel using M-Pesa: “We chose M-Pesa because customers asked for it,” Lena Munuve, Vivo Energy’s retail manager, tells The Mobile Wallet Report. Organisations mentioned include Amazon, Bank of England, Bendigo and Adelaide Bank, Berg Insight, BICS, Biotherm Homme, CashStar, Coles Supermarkets, Commonwealth Bank of Australia, Credit Suisse, Debit Network Alliance, Digital Grass, Discover, eServGlobal, Eftpos Australia, Fido Alliance, Fiserv, Frost & Sullivan, GoPago, GSMA, Hexapay, HomeSend, Ingogo, MasterCard, McDonald’s, Microsoft, Oxygen8, Safaricom, Shell, Sixdots, Swirl Networks and Vivo Energy Kenya. 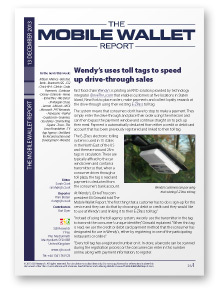 Wendy’s uses toll tags to speed up drive-through sales: Technology provider iDriveThru.com’s president Eli Grinvald explains how the fast food chain’s customers on Staten Island can use their existing EZ-Pass toll tag to avoid stopping to make a payment. The Internet of Things gets closer: Jim Zemlin, executive director of the The Linux Foundation, explains why the AllSeen Alliance “is the best bet yet to make the promise of the Internet of Things a reality” and the Bluetooth SIG’s Errett Kroeter sets out how the new Bluetooth 4.1 specifications will improve the functionality of Bluetooth Smart devices and lay the foundations for the wireless standard to have a key enabling role in the Internet of Things. Organisations mentioned include AllSeen Alliance, Barclays Bank, Bluetooth SIG, CGI, Chick-fil-A, Clinkle, Coinbase, Disney, Estimote, Hema, iDriveThru, ING Direct, JP Morgan Chase, Lemon, LifeLock, Loop Commerce, MCX, Microsoft, P97 Networks, Panasonic, PayPal, Qualcomm, Seamless, SecureKey, Smarty Ring, Square, Tesco, The Linux Foundation, TV App Agency, Ural Bank for Reconstruction and Development and Wendy’s. © 2019 SJB Research Ltd. All rights reserved.